"Yes, child, I am here." "How did I find myself again in this dark wood? I thought it was not the season for it." "It is not. It is supposed to be the season of all-things-restored, not old dark paths again." "Then how is it I find myself here? It is a grievous place." "You were led here, child." "No, not by me . . . It was an old familiar fear that led you here, led you into loss. And you listened to its voice, dear one." "I did listen, didn't I? I did not mean to! I tried so hard to stop my ears and push its voice away. 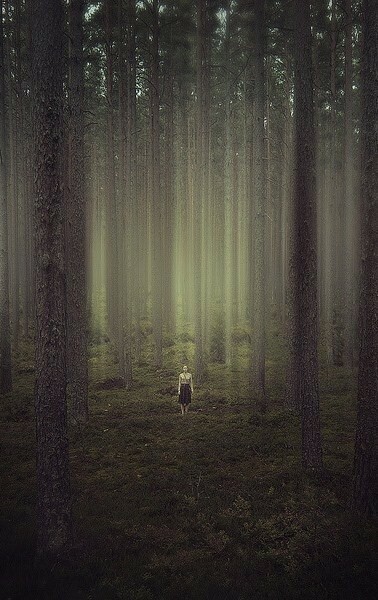 But it overwhelmed me, and now I find myself in this dark wood again! . . . Oh, Papa God, what now?" "I think that it is time to go after that old familiar fear, don't you?" "Yes. With all my heart I wish to run it through and NEVER hear its voice again!" "Exactly what I was thinking . . . do not worry; I will lead you out of here and you will not return again . . . but first, let's begin the chase!"